We had a fun discussion last time about Lincoln in the Bardo, which we all liked. It isn’t often that we all (generally) like a book, so you can take that as a recommendation! We thought it was unconventional yet touching. 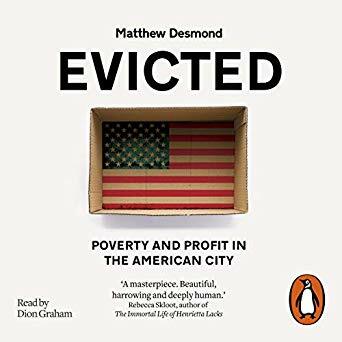 Our next selection is Evicted: Poverty and Profit in the American City, reportedly one of President Obama’s favorite books of 2017. Author Matthew Desmond won the 2017 Pulitzer Prize for General Nonfiction for this book (and has won other prizes). Read more about him and the book at Amazon or Goodreads. Please visit your local library or bookstore, get the book, and start reading (or listening). We meet 7 pm on Wed, Feb. 13, to discuss. Bring your opinions! All are welcome, even if you haven’t finished the book.